Before our young people leave school with hard-earned qualifications, we have our own internal way of recognising and promoting attainment and achievement. Commendation Merits are issued by all staff formally at regular intervals. Based on their work in class, pupils can be awarded Commendation Merits for Respect, Responsibility and Achievement. Commendation Merits are based on our expectations for positive behaviour (see Behaviour Policy section) and all young people can expect to receive these awards if they have continuously met these expectations for their teachers. Additionally, any pupil may receive a Commendation Merit at any time for demonstrating our values in any aspect of their school life. For the purposes of Commendations, our value of Achievement includes Attainment. Achievement Merits are recognised separately. These are given to any pupil, at any time, by any member of staff in recognition of achievements outside of the classroom. This includes extra-curricular activities. We celebrate the achievements of all of our young people at our annual Awards Ceremonies (S1 to S5) and Graduation (for S6). At Awards Ceremonies we celebrate the most notable Achievements of our pupils and Charleston Achievement certificates are given to pupils in recognition of notable achievements out with the classroom environment. Commendation Awards are given in recognition of our school values and expectations for positive behaviour. As Commendation Merits are issued by all staff throughout the year pupils can collect a significant number of these. At our awards ceremonies or end of session assemblies pupils might receive either a Bronze, Silver or Gold Commendation Award based on the total number of Commendation Merits they achieve throughout the session. Points are deducted for negative monitoring (poor or anti-social behaviour, not being prepared for lessons etc). Pupils achieving an exceptional number of Commendations and who have no negative monitoring may be awarded our highest award – Platinum. Our Graduation Ceremony marks the completion of our young people’s secondary education. In meeting this significant milestone we believe it is important to recognise the hard work of all young people leaving school at this stage. Therefore, as young people complete S6 they attend a formal Graduation Ceremony to which their parents are invited. As well as Charleston Achievements and Commendation Awards being celebrated, all young people also receive a graduation certificate and an acknowledgement of the journey and pathway they are about to take as they leave school. The highlight of our Gradation Ceremony is the announcement of the recipient of our Integrity Award. This stunning sculpture is formed from black Skye Granite from Staffin where Columba1400 is located. Based on a hexagon design to match the ancient granite formations, the hexagon shape was deliberately designed to match the Columba1400 logo and associated values. These concepts proposed by Rector Chris O’Neill were formally designed by Mrs Andrea Gordon. A short presentation is available showing how these concepts are linked. 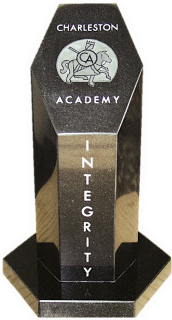 The Integrity Award is presented to the graduate who, in their whole time at Charleston Academy, represents and has demonstrated our Core Values of Respect, Responsibility, and Achievement in all that they do and all that they aspire to be. Our Integrity Award is decided on by a small committee of senior staff who consider nominations for the award from staff and other members of our community. Watch the Keynote Presentation below to see how we celebrate and acknowledge achievement and attainment by our Young People.